I thought this bedroom was absolutely amazing…one of my favorite rooms in the whole designer house. You can see why Phoebe and Jim Howard are some of my favorite A-list designers. I truly admire their work! Phoebe and Jim Howard are a fabulous duo that own several amazing furniture stores (in Jacksonville, Atlanta, and Charlotte). In addition to savoring their numerous magazine features in leading design publications, I have followed their amazing blog for several years, which is no longer featuring new posts, but always featured luscious photos of their amazing work! Anyway, enough gushing…let me get on with showing you the fabulous designer house room created by Phoebe Howard. 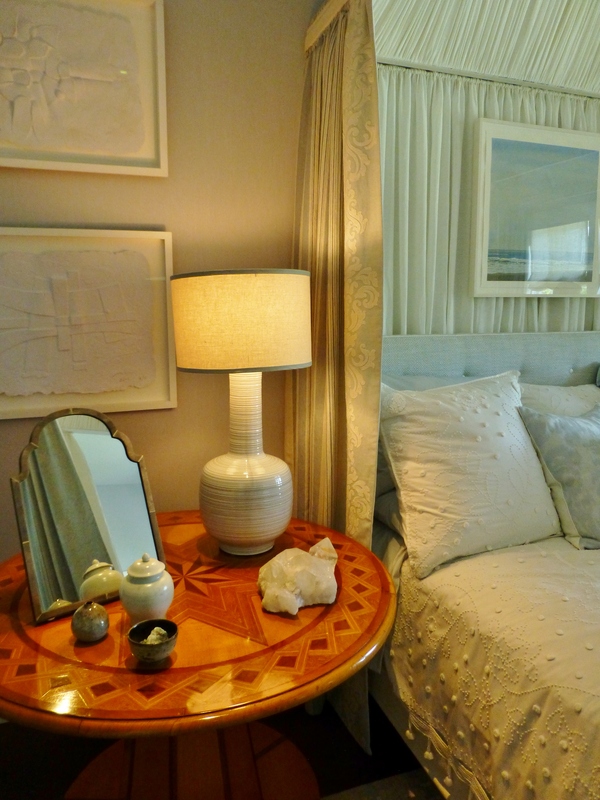 A serene bedroom by the fabulous Phoebe Howard, features soft whites, ivories, and the palest of blues. 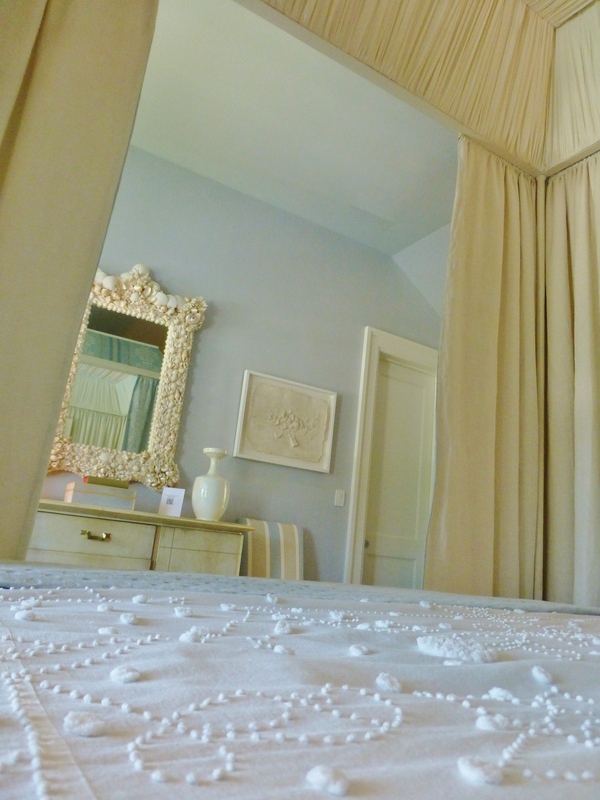 The amazing canopy bed is a cocoon of soft white textures. I love the texture of the candlewicked bedspread. Can you see the detailed panels on the bedhangings, with that amazing pearlescent embroidery work? Here’s a view from inside the bed (no I didn’t climb under the covers, but I would’ve liked to!). Notice the soft blue walls and the painted ivory dresser. So elegant and understated! Here’s a closeup on top of the dresser. 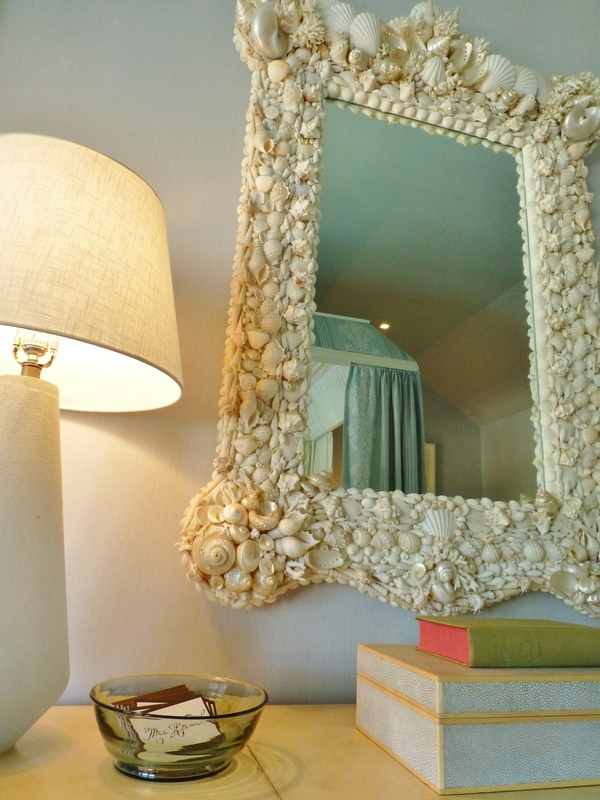 Check out that amazing seashell mirror! 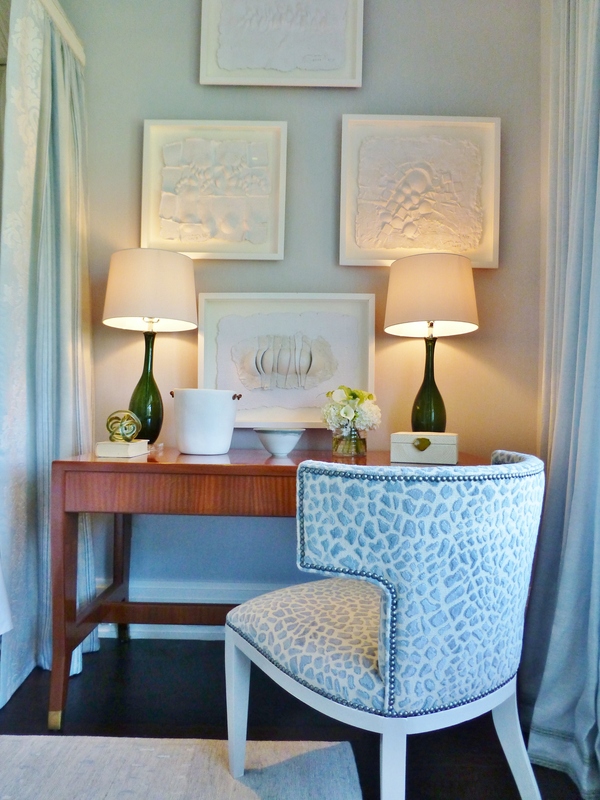 I also love the limited use of tailored accessories in here–that Shagreen box is gorgeous! And, of course, you know how I feel about antique & vintage books…this little green volume adds just the right contrast here! 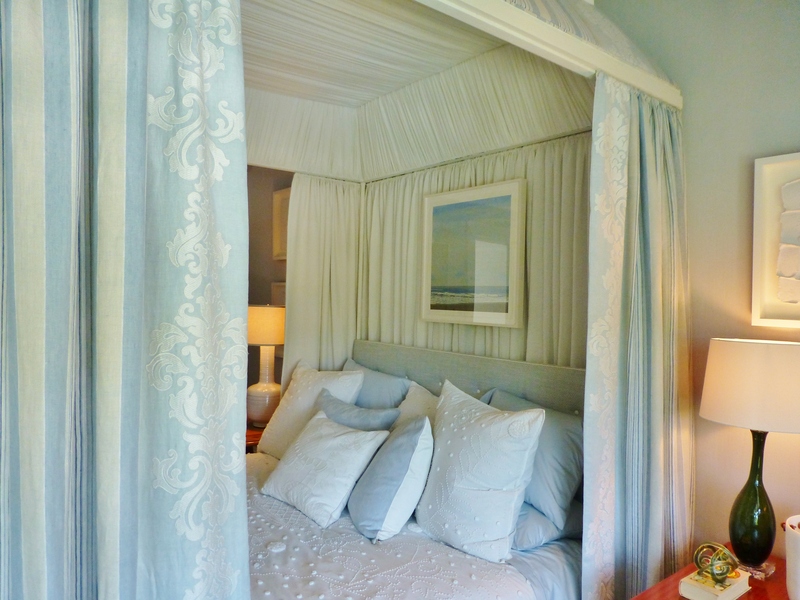 To the left of the bed, and just inside the door is a tailored, yet comfy chair, covered in soft blue linen with kick pleats at the corners of the waterfall skirt. The pillow features a white geometric applique and contrasting welt. And I’m sure you’ve already noticed that terrific garden stool/drinks table beside the chair–I just love those! Beyond the upholstered chair is this amazing round inlaid wood table used as a nite-stand. The table-top is a work of art in itself. Plus the warm wood finish provides some contrast with all the pale, cool colors in the room. The pottery lamp and earthy accessories complete the look along with a functional mirror. On the opposite side of the bed, Phoebe Howard chose to use a desk, instead of a traditional nite-stand. I love this tactic and use it all the time, myself. Desks are so functional and can also be used as dressing tables in a bedroom. The upholstered chair softens the dark wood of the desk. A pair of green glass lamps were used on the desk. This was an unusual choice and a departure from the very limited color palette, but I loved it! The designers used small pops of green throughout the room and it’s very subtle and calming, just like the sky and trees outside. Green goes with everything. 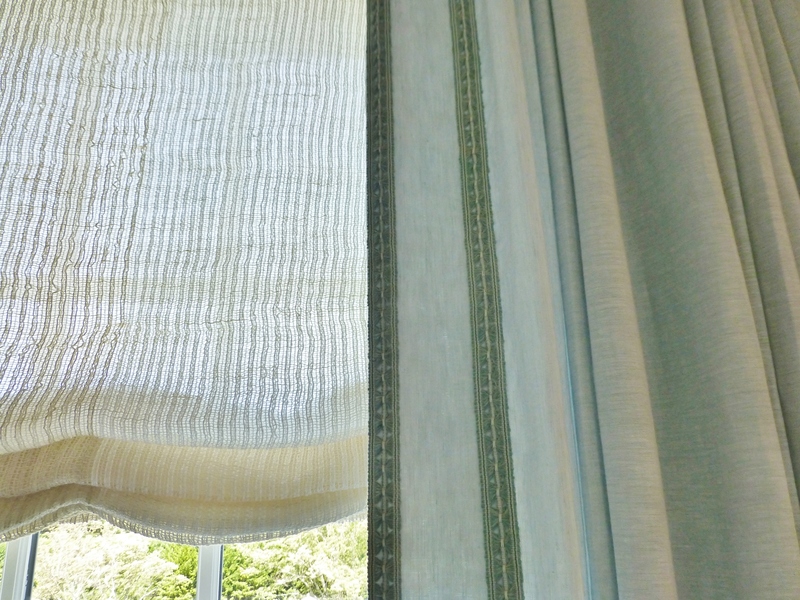 On the windows we find a sheer open weave fabric used for scalloped roman shades. The drapery panels at the sides are made of a soft blue linen. A lovely double row of contrasting gimp was applied at the leading edge and along the bottom for texture and visual detail. The gimp has a bit of green in it, which is the perfect subtle shift from the palest of blues in the fabric. 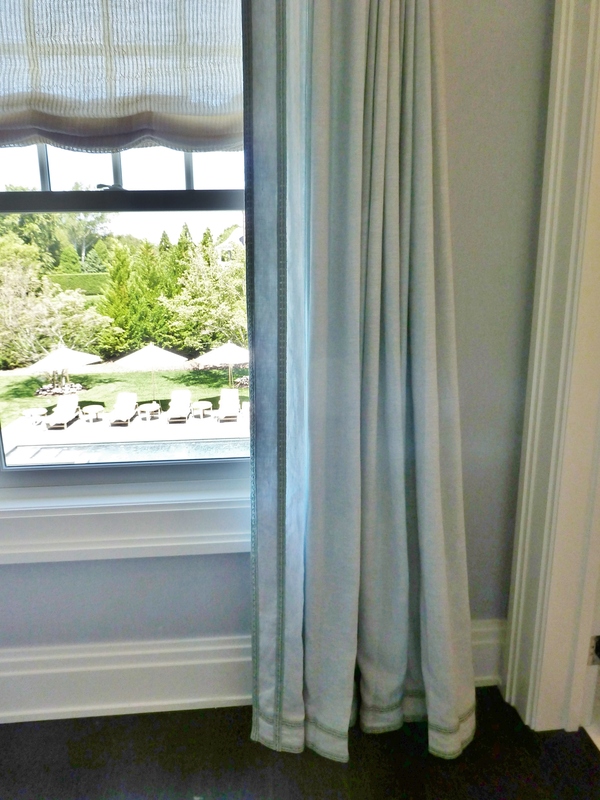 Here is a detail of the fabrics and trims on the sumptuous window treatments in this elegant bedroom. Here’s a quick peek inside the en-suite bathroom. 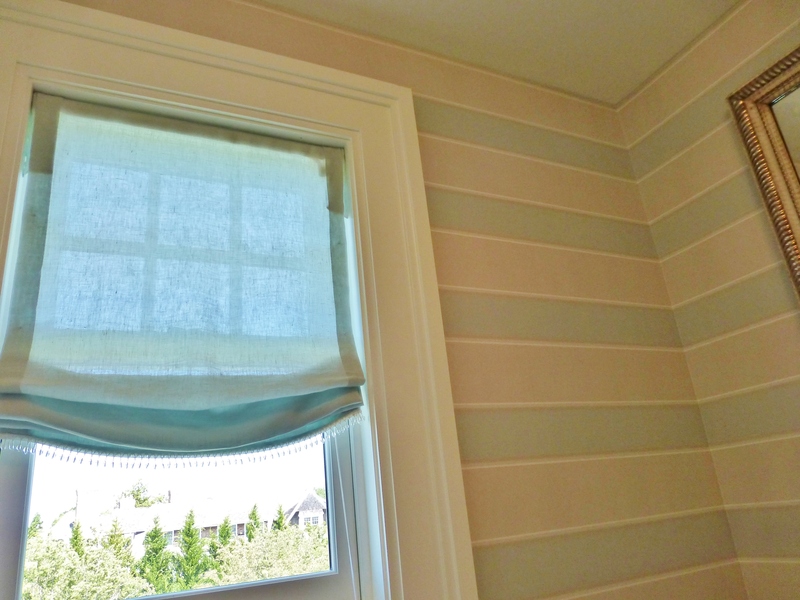 A relaxed roman shade was used on the small window with a bit of glass bead trim. This looks very feminine and pretty, especially when combined with the soft tan and blue horizontal-striped wallpaper. 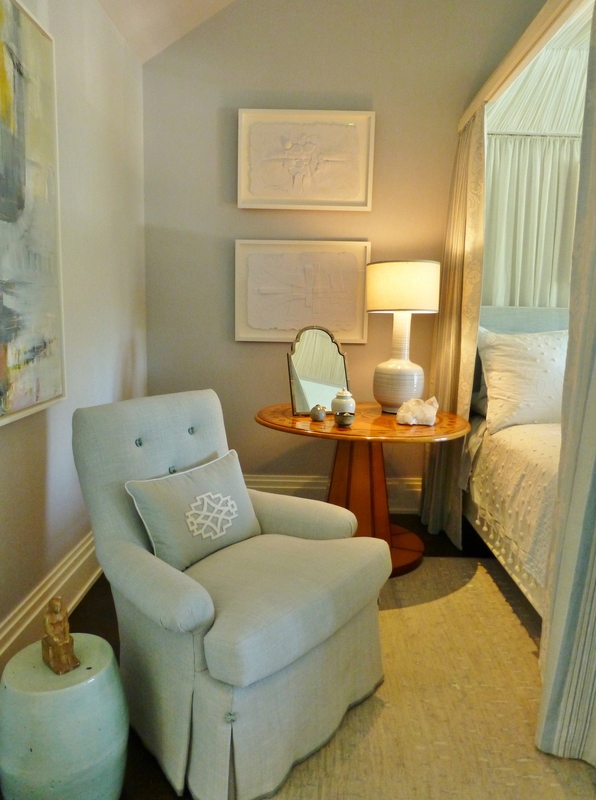 So, what did you think of this ultra-soothing guest bedroom in the 2014 Hampton Designer Showhouse? I thought it was absolutely amazing…one of my favorite rooms in the whole designer house. You can see why Phoebe and Jim Howard are some of my favorite A-list designers. I truly admire their work! 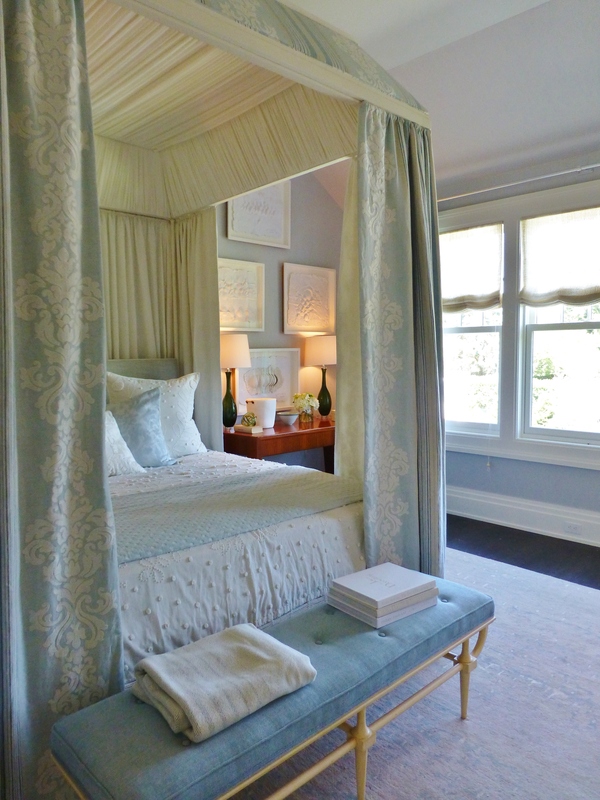 This entry was posted in Designer House, Interior Design & Decorating, Robinson Interiors, The Hamptons and tagged 2014 Hampton Designer Showhouse, Blue, Candlewick, Canopy, Desk, Embroidered, Green, Inlaid Round Table, Painted Furniture, Phoebe Howard, Roman Shades, Soothing Bedroom. Bookmark the permalink. Absolutely stunning room!!! I can see why this designer is a favorite!